“The crowd began to chafe Frank and pass remarks. 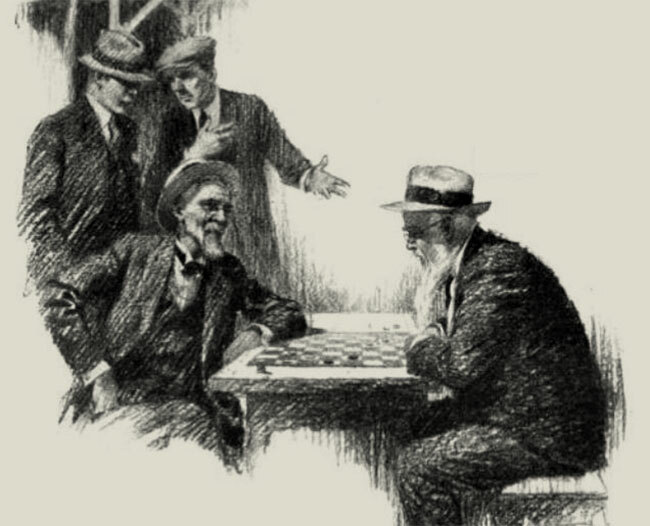 Like one of them said: ‘Whoever told you you was a checker player.” One of several illustrations by American illustrator T. D. Skidmore for “The Golden Honeymoon” in the July 1922 issue of Cosmopolitan. When George Horace Lorimer, editor of The Saturday Evening Post, read the latest submission from Ring Lardner, one of his most popular writers, he decided it was too unlike the author’s previous stories to satisfy the magazine’s readers, who were accustomed to farcical tales of semiliterate baseball players and slang-impaired demimonde characters. “The humor in it is so quiet,” Lorimer responded, that readers “would miss it.” And so he turned down the opportunity to publish “The Golden Honeymoon.” Ray Long, an associate editor at Cosmopolitan, concurred with Lorimer’s decision: “I see what the Post meant. 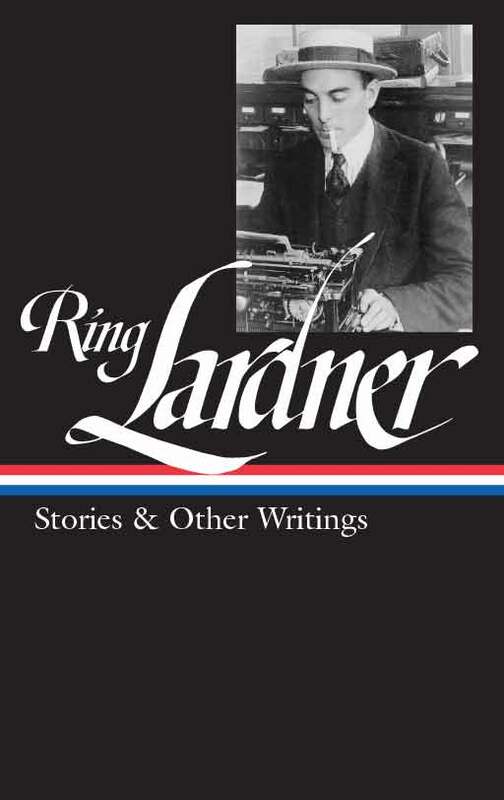 That story isn’t the usual Ring Lardner story. All it is is a fine piece of sympathetic human interest writing. I should be glad to trade you a check for $1500 for it and I shall be very proud to publish it.” The story appeared in the July 1922 issue of Cosmopolitan. It would be ten years before Lardner sent another story to the Post. Fitzgerald admired Lardner’s deflating humor, stoical cynicism, insistence on accuracy, and general knowledge of human nature, and he saw Lardner as potentially a great literature talent. . . . Whereas Lardner often imposed restraints on Fitzgerald’s enthusiasms, Fitzgerald apparently succeeded in convincing Lardner to take himself more seriously as a writer. Notes: On page 539 is a reference to Willie boys, late-nineteenth-century slang for tramps or hobos. “Hearts and Flowers” (p. 541) is an 1893 song composed by Theodore Moses-Tobani, with lyrics by Mary D. Brine, using a melody from the Wintermärchen Waltzes by Hungarian composer Alphons Czibulka. The song was ubiquitous in the 1910s and its title became synonymous with melodrama and sentimentality. Popular in the early twentieth century, roque was a form of croquet played on a hard court with banks along the sides. Usually affecting horses, glanders (p. 544) is an infectious disease, since eradicated in North America and Europe. “Home to Our Mountains” (p. 547) is an English-language adaptation of “Ai Nostri Monti” from Giuseppe Verdi’s opera Il Trovatore (1853). Mother says that when I start talking I never know when to stop. But I tell her the only time I get a chance is when she ain’t around, so I have to make the most of it. . . . If you don't see the full selection below, click here (PDF) or click here (Google Docs) to read it—free! An enjoyable story interspersed with gentle irony, subtle humor and peppery wit. It is a matter of coincidence that the golden couple run into Lucy's erstwhile fiance. It 's amusing how they become close friends with Lucy's first fiance and his wife. A surfeit of each other's company make them fall out with each other. There is mild misunderstanding for a while between Lucy and her husband.But like sensible 50 year old couple, they kiss and make up and enjoy the remaining period of their commemoration trip. An unusual story well narrated.